The veneration of Virgin Mary s Immaculate Conception has long been part of the tradition of the Church. In Latin Church, the tradition dates back to the 8th century. In 1477, Pope Sixtus IV established the feast of the Immaculate Conception in Rome. Sińce Pope Pius V, the feast has been celebrated in the whole church. Before the establishment of the Immaculate Conception as a Roman Catholic dogma, the mystery of Mary was vigorously protected by Jesuit theology. Litany of Loreto reveals deep dogmatic knowledge and ado-ration of Mary: “Magnificat anima mea Dominum […] quia fecit mihi magna (…)”. The architectonic altar of the Blessed Yirgin Mary’s Immaculate Conception was madę by Johann Riedel in 1696. The altar is flanked by łonie columns, has semi-circular arch and curved cornice. The altar is in white and gold with grained construction elements. The antependium is decorated with the depictions of Noah’s ark with an arch of vine branches and a Pigeon of Peace over it. 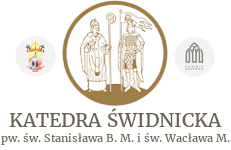 The arc symbolizes Mary who intercedes to bring salvation to mań. Predella conists of two parts. The upper part depicts Noahs Ark, the lower part depicts queen Esther pleading to king Aswerus to save Israelits from annihilation (Est 8.3). Esther serves as a predecessor of Mary as far as inter-cession is concerned. The panels of the pedestal of the altar arę decorated with reliefs containing symbols of the Litany of Loreto, accentuat-ing significance of Mary in Church (Mary – our Tower of David, Tower of Ivory, House of Gold, the Incarnate Rosę…). In the central part of the altarpiece, there is a relief depict-ing the Immaculate against a landscape with a city skyline in the background. 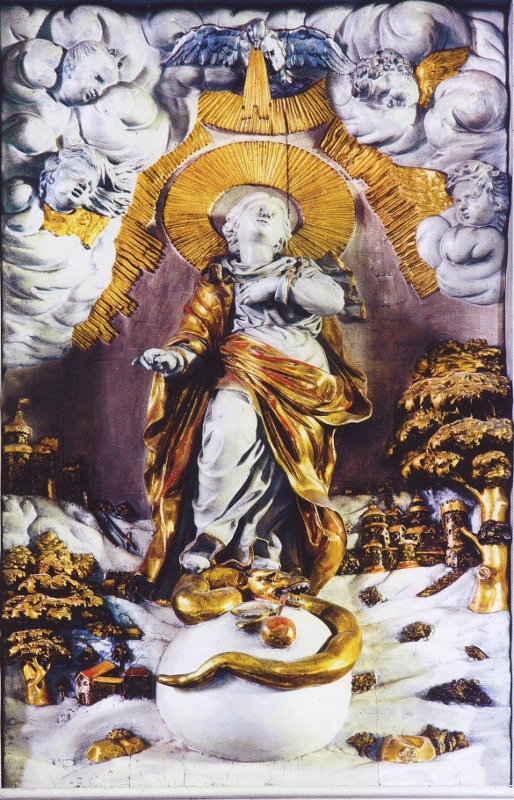 The figurę of Our Lady is depicted with a radiant glory reminiscent of the solar disc, and under her feet is a globe and serpent entwined around the globe. Above the head of Mary is depicted symbol of the Holy Spirit, symbolizing the mystery of the Incarnation. On the very top of the altar is depicted an angel holding a heart of gold, symbolizing the pure and loving heart of Mary. On both sides, there arę cherubs with roses, a reference to the invocation “the Incarnated Rosę” and serve as symbols of mystery (sub rosę) of Incarnation.